Excellent build quality & features for very little money. The Poulan Pro PP5020AV is an exceptional gas chainsaw for under $200. Poulan Pro is owned by Husqvarna, which means many of the components on the Poulan Pro PP5020AV are taken straight from other Husqvarna chainsaws — such as the anti-vibration system. If you disassemble the chainsaw you’ll notice the iconic Husqvarna “H” on various components. When buying the Poulan Pro PP5020AV you essentially get the equivalent Husqvarna quality, comparable to the Husqvarna 440E gas chainsaw — for a lot less money. I know, it’s not exactly the same, but the overall reliability and build quality is similar. In some ways it’s better, because you get a lot for very little money. It’s inexpensive — not cheap. If you’re not impressed by the Poulan Pro PP5020AV by the time you finish reading this review then I’ve clearly failed to convey how much value you get with this chainsaw. For starters, you get a powerful 50.8cc chainsaw with a 20″ bar & chain which is more than enough power for the majority of homeowners. One of the things that I really love about this gas chainsaw is the fact that you get anti-vibration handles which is essentially the same technology that you get when buying consumer Husqvarna chainsaws, such as the 445 or 455 Rancher model. Yes, it’s true, the Poulan Pro PP5020AV is very-well constructed and built to last. Designed with spring assisted starter system for ease of starting. I’ve written at length about anti-vibration handles because I think it’s an essential feature if you plan on spending a lot of hours with your chainsaw. The vibration of chainsaws – and other power tools – can cause a medical condition known as Hand-Arm Vibration Syndrome, which I wrote at length in beginning section of my article on Anti-Vibration Gloves. And yes, anti-vibration gloves are also a good idea even if the chainsaw you’re using has anti-vibration handles. It’s far better to be over-protected rather than under-protected when it comes to using a chainsaw. Safety first! Either way, for under $200 you get an excellent anti-vibration system that will protect your health. Remington also makes a comparable gas chainsaw with anti-vibration handles that I’m also a big fan of — Remington RM5118R Rodeo (18″ – 51cc). I covered it as one of my top picks the Best Chainsaw for Homeowners and in Best Chainsaw for the Money. Made with a patented DuraLife engine, which is has chromium plated cylinders for increased durability and longer lifespan. The DuraLife engine has been strengthened overall and is designed for the long-term. Let’s face it, chainsaws take quite a beating over time so it’s easy to understand the importance of tougher components, which enable your chainsaw to handle more abuse. Incorporates Poulan Pro’s Super Clean Air Filter System — which provides an extended air filter life, while reducing fuel consumption without losing any power. Well-engineered and made with high quality components for homeowners. The chain that you get with Poulan Pro PP5020AV is not very good, so the first thing you need to do if you buy this chainsaw is — at the very least — replace the default chain with the: OREGON 72LPX070G 70 Drive Link – Super 70 Chisel Chain — you won’t regret it. — Although, I recommend upgrading both the bar & chain to the more common 72 drive link chain. The default chain is a 70 drive link type but most 20″ bar chains at your local dealers will have 72 drive links. Get the: OREGON 72LGX072G – 72 Drive Link Super Guard Chain. Upgrade the bar & chain to greatly increase your cutting efficiency. OREGON 72LGX, 73LGX, and 75LGX (3/8″-pitch Super Guard ) chains feature cutters that have an advanced grind geometry that is “work ready”. This series saw chain is only for professionals who demand saw chain that delivers high performance, resists stretch, simple to maintain, provides long life, and is consistent from loop to loop. And, you’ll also need to upgrade the bar in order to fit the OREGON 72LGX072G chain. If you want a professional quality bar I recommend the OREGON 200RNDK095 — 20″ Power Match Bar. If you want the 72 drive link chain you’ll have to upgrade to this bar. Chrome-moly steel provides superior bar-body strength & tough rails. Resistant to wear & chipping. Lubri Jet oil holes enhance bar-chain lubrication. Long nose takes most of the abuse, minimizes wear to the body. Lubri-Dam oil-retaining keeps more oil on the bar and chain, preventing oil from leaking. For under $200 this is almost a perfect chainsaw but there are a couple issues that you should know before purchasing it. First, it’s relatively heavy, weighing somewhere betweeen 15.5 to 20 lbs. Sorry, I can’t find the exact weight anywhere online. Either way, I certainly can’t recommend it for extensive limbing but it’s perfectly suited for cutting small to medium sized trees, as well as cutting firewood, clearing brush and other various cutting duties around the yard. And, it tends to go through a lot of bar & chain oil so make sure you stock up — you’ll need it. The Poulan Pro (952030130) 1 gallon container is a good value. But these are minor quibbles that I wouldn’t let sway you against it. 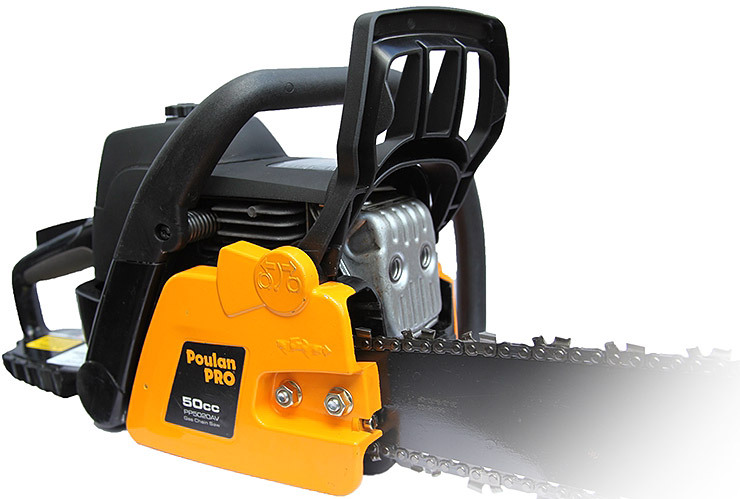 If you’re not strong or have a small build then maybe this chainsaw might be too heavy for you, but if you’re healthy and of average build then you’ll be just fine handling the Poulan Pro PP5020AV. Poulan Pro bar & chain oil. Overall, the Poulan Pro PP5020AV chainsaw is one of the best chainsaws for homeowners who are looking for a well-balanced chainsaw with ample power, cutting effectiveness and cost. I consider this to be an inexpensive chainsaw, but not cheaply made. In fact, quite the opposite. It’s an excellent all around medium duty chainsaw ideal for general property maintenance and firewood cutting. It has Poulan Pro’s Super Clean air filter system, an aluminum Professional style clutch cover for increased durability, an automatic gear driven oil pump, easy to access (tool-less) air filter and spark plug, anti-vibration handles with an effortless pull starting system. Also, comes with an on-board locking wrench holder that’s been designed as part of the rear handle — and a versatile 20″ bar length. It comes fully assembled and includes an excellent hard carrying case. 2 year limited warranty. Whew! I’m exhausted just mentioning all the features. Honestly, I don’t know what else you want for under $200. This should be at the top of your list if you’re on a budget and still want a high-quality chainsaw. I’d put this on par with the Remington RM5118R Rodeo, but I’d have to make the Poulan Pro PP5020AV my pick for the best chainsaw under $200 — mainly because many of the components are made from Husqvarna. View or download the Manual for the Poulan Pro PP5020AV. View or download the Parts List for the Poulan Pro PP5020AV. Close-up view. It’s very yellow. Use the OREGON bar & chain selector guide to see which of their parts are compatible with the Poulan Pro PP5020AV. Learn more about the Poulan Pro PP5020AV on Amazon. Highly efficient and clean running engine: Duralife 50cc 2-cycle. 20 inch bar & chain. No tool required to access the air filter and spark plug. Super clean air filter system can run longer before cleaning. Anti-vibration handle reduces operator fatigue. Quick & easy pull-starting mechanism. Convenient attached scrench holder & carrying case. Comes with a high quality carrying case. Here are a couple videos of the Poulan Pro PP5020AV that you may be interested in viewing. It’s always nice to a see a product in motion before you decide to purchase it. Unfortunately, Poulan Pro doesn’t seem to create their own promotional material for their products. It’s disappointing when companies don’t create professional videos for their customers. I think they would sell a lot more units if they improved their overall marketing strategy — but that’s true for any company. C’mon Poulan Pro, create videos for your customers! See and hear the Poulan Pro PP5020AV powerhead running. Watch the Poulan Pro PP5020AV cut through a large log. The video quality isn’t great but it’s nice to see it in action.